Get out those old pots and pans – because we’re hosting a wassailing event. We’re not expecting our event to be quite so riotous – but it will be fun and is aimed at providing an afternoon out for the whole family. It is taking place at Etton High Meadow on Saturday, January 26. We hope the wassail will awaken them to bear bountiful crops of fruit next year. So please bring some pots and pans to make a noise. The fun starts at about 3pm and will go on until about 5.30pm. As well as the traditional wassail (in a more civilised form) there will be musical entertainment with Alan Wood singing traditional songs and various events for children including making bird feeders out of apples. Traditionally the celebrations vary from region to region. In some cases a wassail King and Queen lead the assembled group of revellers, comprising the farmers, farm workers and general villagers, in a noisy procession from one orchard to the next. 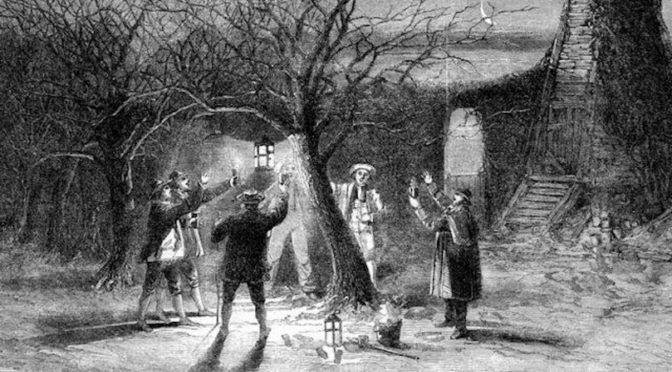 The custom of apple tree wassailing is celebrated across the country, on either the new or old Twelfth Night. An original house to house version before Christmas was designed to obtain gifts from the Lord of the Manor in exchange for a blessing. This has evolved into what we now know as carolling. Etton High Meadow is on the Maxey Road just outside Etton. From the Helpston road go past the Golden Pheasant pub and through the village towards Maxey. You will come to a small hump back bridge. Cross it and Etton High Meadow is about 150 yards on the right through a gate. There is parking on site but please drive carefully because children may be already there. It is advisable to wear warm clothing and a torch might be useful because it gets dark early.